My family was extremely fortunate to be invited on an epic adventure to visit a remote tribe in Africa early this year. We jumped at the chance, of course. Rieko and I and our now adult kids had taken this kind of journey before when we visited the Achuar tribe in the Amazon years ago. (Check out the story of that adventure in chapter 11 of Take That Leap.) 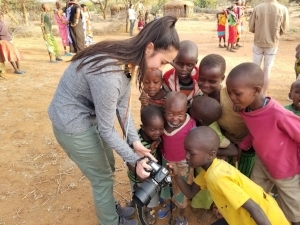 So this January when Devon’s friend, documentary filmmaker Chip Duncan, invited us to visit the Maasai tribe in eastern Africa with him, we decided we just had to go. None of us Bennetts had ever been to this region of the world before. Aqua-Guard has done business in African countries that have a coastline (like Egypt, Sudan, Nigeria, Cameroon and Djibouti). But, personally, I’d only visited Egypt. Through Kokoro, we Bennetts recently started supporting schools and wildlife conservation work in Kenya by gifting funds to the Loisaba Community Conservation Foundation. This would be an opportunity of a lifetime to see for ourselves what was happening there and in neighboring Ethiopia, where Chip and his friends have been doing their own (oftentimes hands-on) philanthropy by supporting a water development project at a local school for the past year. “The Maasai” might sound familiar to you. Way back in 2010, Maasai Chief Paul Lebeneyio was a contestant in CBS’s Amazing Race: China Rush. 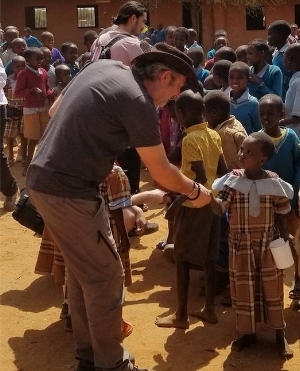 The money he made on that show went into creating a Maasai-run ecolodge in Kenya—and that’s where we would stay while we visited the Laikipia area. 4/ Teachers, classrooms and supplies to over 400 children. The Maasai children, we soon discovered, hadn’t met many foreigners at all. When I first took my sunglasses off, they jumped backwards. It seemed to me that they had never seen a man with BLUE eyes before! And when Kina took a photograph of one boy, his eyes went wide as saucers when she showed him what he looked like. Not one child had ever seen themselves before. By the time we left for our trek into Ethiopia, both Devon and Dylan had been indoctrinated into the Maasai tribe as honorary warriors. And the chief had given me a favored bracelet that he wore on his wrist all the time.